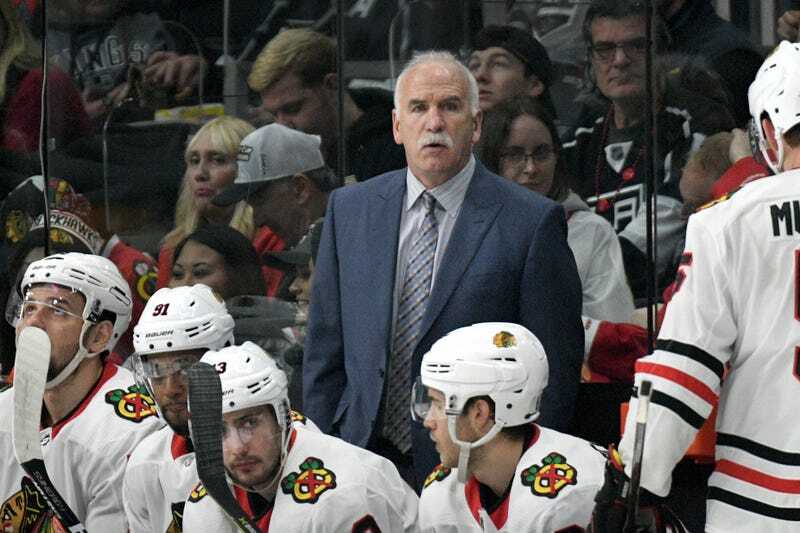 My headline is slightly glib, because Joel Quenneville—the second-winningest coach in NHL history—was fired for the same reason every coach is fired: the Blackhawks just aren’t very good. But the thing is, it’s really not Quenneville’s fault at all. Quenneville had been coach since 2008, and in 10 seasons, they won three Stanley Cups and made another pair of conference finals. But last year was the first time Chicago had missed the playoffs in the Quenneville era, and it wasn’t a fluke: This team is, on the whole, old, undertalented, and top-heavy capwise. Those problems are not immediately fixable. They are also very clearly not a coach’s fault. If a roster is the problem, that’s on the GM. But I have trouble putting too much blame on Stan Bowman, who’s been heading the front office since 2009. Bowman did excellent work for years keeping the Blackhawks competitive long beyond the usual cap-allowed window, through a series of creative and potentially risky moves. They haven’t all worked out—the second Brandon Saad trade has been disastrous—but many did. But you can only kick the can down the road for so long, and with Jonathan Toews and Patrick Kane together making more than a quarter of the cap, the time to pay the piper was going to come eventually. It’s here, and it’s very messy, but it was inevitable. (Well, barely evitable; the Penguins are dark magic.) Still, if someone had to go, it’s a little baffling that it was Quenneville before Bowman. Quenneville will have his choice of jobs. The Blackhawks are going all the way in the other direction, transitioning from the league’s longest-tenured head coach to its youngest, 33-year-old Jeremy Colliton, who has just one full season of coaching in North America under his belt, with the Blackhawks’ AHL affiliate. A young coach is perhaps just the thing for a team that’s going to need to get drastically younger on the ice. That process is going to be unpleasant, but it’s overdue. Are The NHL&apos;s Mini-Dynasties Dead?